HAARLEM, The Netherlands - The USA Baseball Collegiate National Team pitching staff continues to dominate Honkbal Week as Cal State Fullerton teammates Justin Garza and Thomas Eshelman combined for the squad's third consecutive shutout while Bryan Reynolds (Vanderbilt) was 4-for-4 with three RBIs in a 6-0 win over Japan at Pim Mulier Stadium on Tuesday. "The pitching has set the tone just about every night out, giving us the opportunity to jump out and get the lead," Team USA manager Dave Van Horn (Arkansas) said. "Coach Childress has them piggy-backed where it is pretty much set so that the starter goes until they reach their pitch count and the next guy is ready to come in. "You can just see the competition among the pitching staff. They don't want to be the guy to have a bad inning or give up that run. We certainly don't expect other teams not to score on us but our guys are competing against each other and it has been a pleasure to watch. Team USA has allowed just one run on 13 hits through its first four games at Honkbal Week and has not allowed a runner to touch home over the last 30.1 innings. It has now shut out all three opponents at the tournament, having no-hit the Netherlands on Saturday and blanked Chinese Taipei on Monday. The only run the U.S. has allowed came with two outs in the sixth inning of a 1-0 loss to Japan in the opening game of Honkbal Week last Friday. Garza improved to 2-0 this summer with six scoreless innings in which he faced just one over the minimum with five strikeouts. Eshelman picked up a three-inning save, fanning seven of the 10 batters he faced in the process. The U.S. offense took advantage of nine walks by the Japanese pitching staff, pounded out 12 hits, the highest total for any team so far in the tournament, and stole six bases. "Tonight, I thought our offense came through with some big hits, we did a good job of getting our leadoff man on and were able to manufacture a couple of runs," Van Horn said. "We scored three or four runs with two outs and just kind of chipped away to put the game away. Our pitching has really allowed our offense to relax and know that if it can find a way to score two or three runs, we are going to have a very good opportunity to win the game." Four of those hits came off the bat of Reynolds who had RBI singles in the first and fourth innings and a run-scoring double in the eighth. He also stole a base and drew a walk en route to earning player of the game honors from the tournament organizers after the contest. Elsewhere on the offensive worksheet, Chris Okey (Clemson) was 1-for-2 with three walks, two runs scored and three stolen bases, including one of home on a double steal in the eighth. Blake Trahan (Louisiana Lafayette) was 3-for-4 with a double and a stolen base while Alex Bregman (LSU) finished 2-for-3 with an RBI and a stolen base of his own. 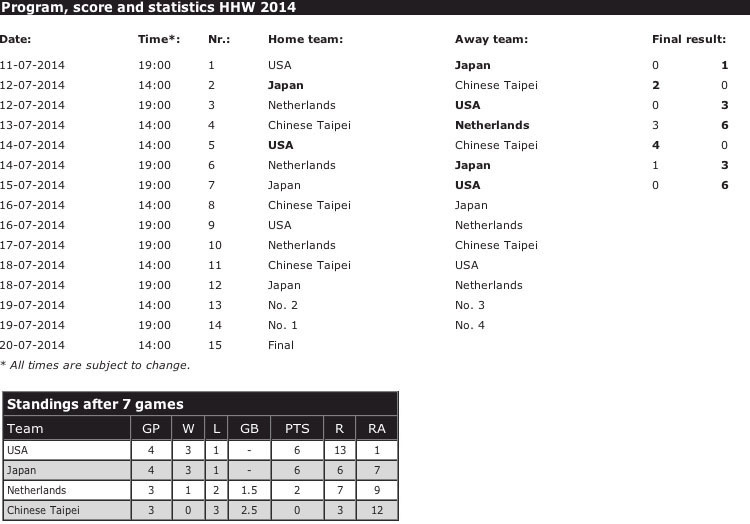 The Collegiate National Team continues the second half of the double round-robin portion of Haarlem-Honkbal Week on Wednesday against the host Netherlands. First pitch is set for 7 p.m. local time (1 p.m. ET) at Pim Mulier Stadium. UCLA right-hander James Kaprielian will make his second start of the tournament for Team USA. He previously threw five shutout innings against Japan last Friday.